If you need shoes for a 1920s period correct look and and want to do it right the first time. Stacy Adams Madison shoes are for you. Featuring that style was seen back during prohibition, these shoes continue to have a huge fan base. 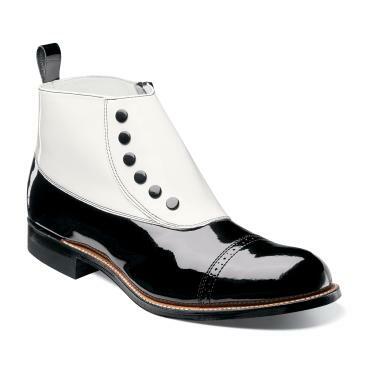 These Great Gatsby style shiny black and white leather boots feature that 1920s look in the same biscuit toe style that has kept these spat boots going for generation after generation. If they were great for the Great Gatsby, these boots will be great for You.